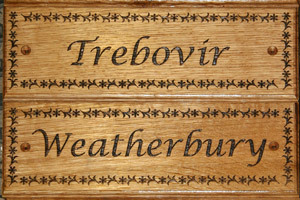 Elegant Signs - Wooden House Signs - Choose from Oak, Sapele, Cherry or Iroko - Most images can be used. The Elegant wooden house signs and nameplates are perfect where fine detail is desired. We can create the signs with delicate fonts, borders and images with finer detail and even line drawings. Also we can engrave the lettering in your sign as small as 10mm therefore these signs are ideal when several words are wanted. Timbers - The Signs at 100mm and 150mm high can be made in Oak, Sapele, Cherry and Iroko. For Signs made 225mm high we prefer to use quartersawn Oak that is 25mm thick and very sturdy. Oak is a very beautiful timber that is very durable but does need to be maintained as does Sapele and Cherry. Iroko timber has a very high oil content and can be left untreated. Holes - We can drill holes in the sign for you - 2 for a sign 100mm high, 4 for larger signs. Alternatively you could use one of the many adhesives on the market. *For 225mm high signs and over 300mm long we prefer to use quartersawn oak which is 25mm thick. 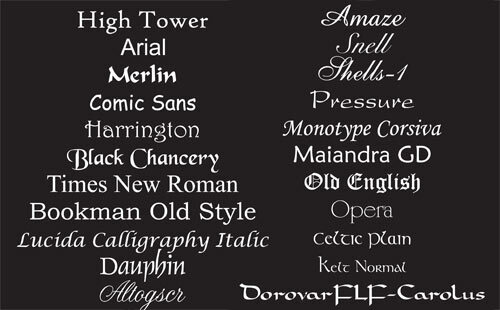 The ideal lettering size is up to 30mm.